Police officials stand outside of the L.A. 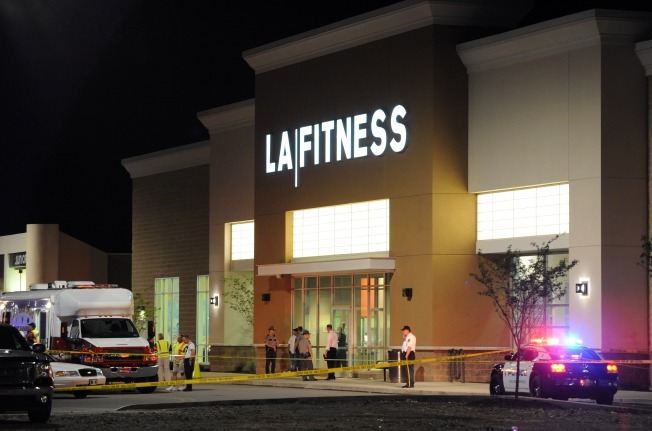 Fitness Center where a gunman reportedly opened fire in the aerobics room Tuesday, Aug. 4, 2009 in Bridgeville, Pa. The man who shot and killed three women at a health club aerobics class in suburban Pittsburgh kept a dark web diary detailing an earlier plot to shoot up the gym before he "chickened out." Cops said he did not have a relationship with the victims. George Sodini, 48, apparently wrote of his troubles with women, alcohol abuse and his plan to shoot up the gym 4,610-word Web page that showed his intentions to go through with the horrific shooting over the course of nine months. The site's author wrote of targeting the same Tuesday-night aerobics class on Jan. 6. "It's 8:45PM: I chickened out!" he wrote. "I brought the loaded guns, everything. Hell!" Sodini, who had four guns, turned off the lights and sprayed more than 50 bullets into the " Latin impact" dance aerobics class filled with women Tuesday night before he turned the weapon on himself.